I'm a walker. Not a runner, driver, biker, or skater, just a walker. I love to walk, plain and simple. I even like the word 'walk' - it's one of the few words that bring out the New York accent in me. 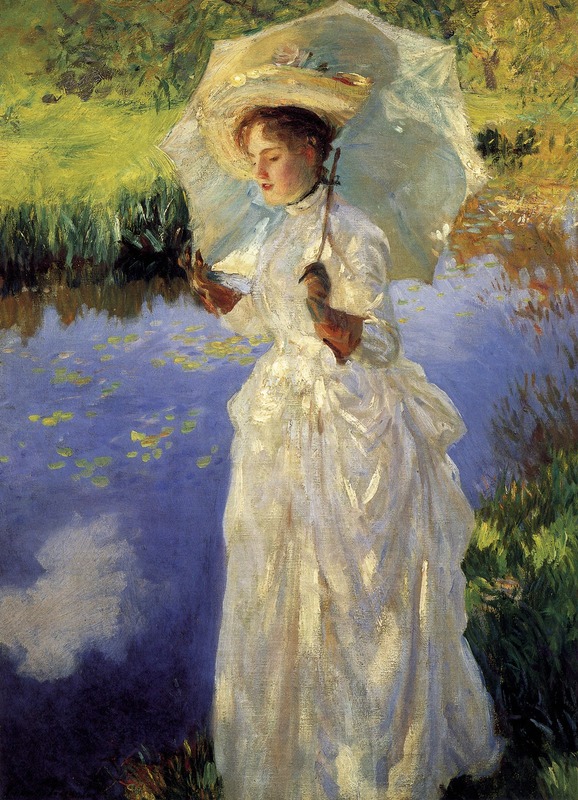 If I feel like being fancy, though, especially if I'm carrying a parasol, I might say 'promenade', or even the Austen-tatious 'take a turn'. However, I don't like having to walk. There's a difference. On a nice, or at least decent day, if a place is within walking distance, which for me could be a few miles depending on footwear and what I'm carrying, then I want to hoof it. If the weather is daunting, or I'm not feeling too well, or for any other whiny reason, I will make a fuss if I 'have' to walk. Sure, you can see a lot from an automobile, but it's more of a passing glance than a true soak-in. When you're on your feet, you can stop without waiting for the next exit (though I don't recommend stopping while crossing the street. That's just dangerous.) And you can get the sense of a city this way - the gradual changes in neighborhoods, the endless shops, restaurants, and people. Though I don't like crowds, I do have my people-watching moments, and this is a way to observe humanity without commitment. If you really want to look at people, though, take a hint from my dearly departed Grammie and sit in a parked car. I promise you, you will see some crazy stuff. Did I mention I'm not a fan of exercising? I don't hate it, but there's a reason why every gym membership I've had has lapsed into non-renewal, even the ultra-cheap Planet Fitness one (I've spent more money in Starbucks during one sitting than in one month's membership.) I get tired of going somewhere, changing into workout clothes, and then spending a chunk of time in public sweating and panting. Somehow, though, I must burn those cake-induced calories, and walking is my way. It's one of the few ways I move where I don't wear out quickly, and I'm usually the one in a group that wants to keep going, while everyone else has called it a day. I'm also brisk walker, so there is a measure of working out going on. I'm trying to wear the proper shoes, though, because I'm usually traversing on concrete, and with the wrong footwear it's damaging to the rest of the body to go the distance. Besides the cost of footwear, it costs absolutely nothing. You can't find fault with that! I love to relax at home with a good book and some hot tea when it's pouring out, or retreat to the a/c when it's sticky out. But when the weather's bad for walking for a long stretch, I start to feel gloomy. After a substantial hike, though, my mood tends to be at its best. There's scientific explanations for this, but I'm not a scientist, so suffice it to say it does a body good in more ways than one. Again, you see so much when you cover lots of territory, and you'll probably want to remember what you see. Carrying a camera certainly helps keep the memories alive, and let's stop there before this turns into a greeting card. I've kept a semi-regular New York photo blog, and most of the pictures were taken from the marathon walking sessions. Here, though, I'm going to have a new feature, covering some of my favorite long walks. It's almost the reverse of the 'Wish You Were Here' feature, because there I tend to want places to be a short distance from my home. So, new paths coming soon!